You're on your way to putting time and money back into your business. Save 10 cents off a gallon for the first 6 months! After 6 months, save up to 7.5 cents per gallon! Use your Rutter’s Rewards Card, in combination with your fleet card, for an EXTRA 3 cents off per gallon…ALWAYS! Access account data and transaction information through our easy-to-use website 24/7. Customer enabled account management online. 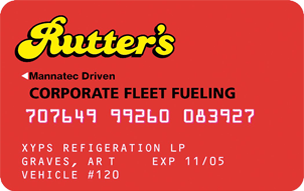 The Rutter's Private Label Card isn’t just a gas card, it’s a robust fuel management program. A program that provides the control, savings, and convenience your business needs. Experience complete online control 24/7! The Rutters’s Private Label Card provides fleet managers with detailed reporting, individual spending controls and acceptance at many locations in the United States. When you use the Rutter's Private Label Card, your business will save cents on gas and diesel fuel. This makes the Rutter's card the smart choice for your fuel management needs. When the Rutter's Private Label Card is used at a fuel station, prompts are required prior to each purchase. This data allows for a detailed tracking of vehicle and driver purchasing behavior. The Rutter's Fuelman Network Card program provides access to the reports and information you need to manage your fuel expenses efficiently, helping you reduce the amount of time spent on administration. The Rutter's Private Label Card can be tailored to your business needs. You can set prompts to ask for vehicle or driver number prior to purchase. If needed, cards can be shut off at any time. Get secure online access 24/7 to transaction data, Card is and driver ID information.